A dog shop opened in downtown Salt Lake City earlier this year—not a pet store, but a place to satisfy your cravings for gourmet hot dogs. Whether the desire for this American food classic comes at noon or midnight, Good Dog will not disappoint. 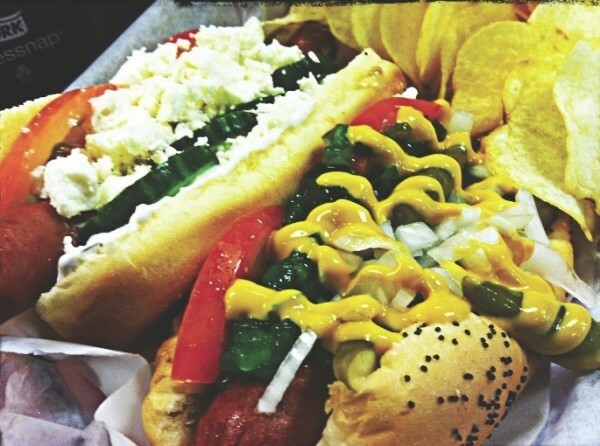 The Doggy Deal includes one “top dog,” house chips and a drink for $6.75 ($9.75 for two dogs). With 14 “top dog” choices, you will wonder how you can limit your intake. Good Dog really swings for the fences with the Chicago dog. It’s a Nathan’s Famous Kosher dog with sport peppers, neon relish, green onion, tomato, pickle wedge, mustard and celery salt. It’s sweet and mouth-puckeringly spicy at the same time. Now, what should my second dog be: Rabbi, Bronx, Seattle, islander or one of the others? The Bronx it was. This is a Sabrett (the company that created the original New York pushcart-style frankfurter, famous for hot dogs that “snap”) with pepperoni, “Mom’s marinara,” banana peppers and mozzarella. This sounded out-there at first, as most of these ingredients go on pizza or pasta, but out-there can often end up being delicious. The genius behind marinara on the Bronx deserves an award. A good, flavorful marinara sauce makes sense on plain pasta, but would it drown out the hot-dog taste? Not at all. It was not so spicy that it competed with it, but was sweet enough so that it enhanced the dog. I finished the remainder with a spoon. Just in case two hot dogs don’t fill you up, you can choose from several Good Sides: Mom’s potato salad, bourbon-baked beans, Mom’s coleslaw and house mac & cheese, for $1 each. Or go with one of the sides on your dog; you can do this with the SLC, slaw, Montana or Mac-Daddy dogs. Gourmet choices, convenient downtown location, midday and midnight hours? Sounds like it’s time for Good Dog.